Citation: C N Trueman "Montgomery Bus Boycott"
The Montgomery Bus Boycott started in December 1955. What happened in Montgomery is seen as a pivotal point in the whole civil rights story and brought to prominence a seamstress called Rosa Parks. The structure of southern society pre-1955 ensured that black Americans were very much second class citizens. Southern states had white only restaurants, white only rest zones in bus centres etc. In Montgomery, Alabama, buses were segregated (as was common elsewhere in the South) with specific areas on a bus reserved for white customers and other seats for black customers. The story behind the bus boycott seems simple – yet, as always, there is more to the story than first appears. After a full day’s work, Rosa Parks got a bus home. The bus was ‘full’ in the sense that all the seats for white Americans were in use. Parks was seated in a seat for black Americans. A white man got on board and found that all the ‘white’ seats were full. The bus driver told four black Americans to move further down the bus. Three complied but Parks refused to give up her seat and was arrested. In protest, a boycott of the buses by black Americans in Montgomery began. It was probably the first example of the economic clout that the community had because eventually, the bus company had to desegregate their buses or face serious financial difficulties as very many black Americans used the buses. Without their economic input via fares, the bus company of Montgomery faced probable bankruptcy. However, there is more to the story. 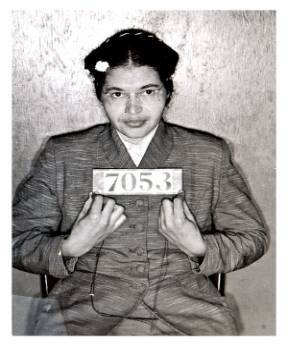 Many believe that the act by Rosa Parks was a reaction after a hard day’s work and that it was not pre-planned. The evidence possibly suggests that the whole issue of a bus boycott had been some while in the planning. As early as 1954, twenty-five local associations in Montgomery had informed the city’s mayor, W A Gayle, that a city-wide boycott of the city’s buses was being planned. The city’s Women’s Political Council was planning a boycott in 1955. To give their movement more impetus, they needed a respected member of the community to be arrested for violating city bus law. Even before the arrest of Rosa Park’s, a fifteen year old student, Claudette Colvin, was arrested on March 2nd 1955 for refusing to give up her ‘white’ seat. However, her case was not pursued by the NAACP as one of the charges against Colvin was assault. What the NAACP wanted was a case that was simply one involved with segregation with no other issue that might cloud the case. The state of Alabama dropped the segregation issue against Colvin and simply pursued a case of assault and battery. It was Colvin’s case in Browder v Gayle that was to end up in a federal court in February 1956 and it was around this case that the Supreme Court declared bus segregation unconstitutional in December 1956. Many feel that Colvin has not received the credit she merits for her part in the civil rights movement. “Claudette was very much a part of the beginning of the movement. There comes a time when you just take so much, and I think this community was just waiting for something to happen and for somebody to point the way to do something about the buses.” Fred Grey, who represented Rosa Parks in her state case. On December 1st 1955, Rosa Parks refused to give up her seat on a bus. Ironically, she got on the bus at the same stop as Claudette Colvin had done on March 2nd 1955. However, Parks had suffered from bus segregation before. In 1943, Parks had paid her fare to a bus driver who told her to get on the bus by its rear door as ‘black’ seats were always at the back of a bus. While Parks moved to the rear door, the bus drove off. Who was Rosa Parks? She is invariably portrayed as someone who had reached the end of her patience after a hard day’s work and refused to leave her seat on the bus, preferring to rest her feet. While this is almost certainly true, there is more to the story. Rosa Parks had been a life-long worker for the NAACP and she had taken a special interest in the Claudette Colvin case. At the time of her arrest, Parks had just finished a course on race relations in Monteagle, Tennessee. She became a seamstress simply because that was all she could find to do in the segregated society of Montgomery. However, Parks had been educated at the all-black Alabama State College. When Parks was arrested, the NAACP asked the police why they had done this. E D Nixon of the NAACP was told that “it was none of your damn business.” After finding out the reason for her arrest, Nixon posted the bond required for her release. The Parks case had none of the potential complications of the Colvin case. The NAACP asked Parks if they could pursue her case with regards to the legality of segregation. Those who had organised the one-day boycott created an organisation called the Montgomery Improvement Association. King was elected its president. MIA had to decide whether to continue with the boycott or to bask in the success of the one-day boycott. Though some wanted to end the boycott after just one day, the vote taken that night showed that the majority wanted the boycott to continue. City officials in Montgomery tried to undermine the boycott. Black cab drivers had charged the same as the buses in an effort to get black people to work in lieu of there being no buses. However, city officials declared that the minimum fare that a cab driver could charge was 45 cents – so the 10 cents being paid was effectively made illegal. To get around this, MIA introduced a private taxi plan whereby those blacks who owned their car picked up and dropped off people at designated points. This overcame the 45 cents fare issue. When MIA met with officials from the bus company, they got nothing. The white community of Montgomery tried to use local newspapers to convince the black community that the boycott had been resolved by printing a story that stated this. MIA had to do a lot of work in a short space of time to convince as many as was possible that the story was a hoax. On January 30th 1956, King’s home was bombed. Men driving the private taxi cabs were frequently arrested for the most minor of traffic violations. Insurance firms withdrew their insurance for the vehicles. King only got round this by getting insurance underwritten by Lloyd’s of London. On February 21st, King along with 88 other people was arrested for organising a boycott which violated an obscure law. He was ordered to pay $500 as a fine with $500 costs. The boycott badly hit shops in Montgomery as far fewer blacks were coming into the city centre. While shop keepers were opposed to integration, they faced losing their livelihood if the boycott continued. MIA also used the courts to fight their case for an end to desegregation. By a 2 to 1 majority a federal court deemed segregation on buses to be unconstitutional. The city authorities had argued that integration would lead to violence – an argument rejected by two of the judges. The black community of Montgomery started using the buses again on December 21st 1956. However, the argument used by the city’s leaders in court came true. Buses were shot at, four churches were bombed, and a bomb was found on the porch of Martin Luther King’s home. Seven white men were arrested for these but no-one was ever found guilty – a deal was done whereby those blacks arrested under the anti-boycott laws had their charges dropped while the seven men had their charges dropped (though King still had to pay his $500 fine). The violence did end and the integration of the buses in Montgomery went ahead with relative success. On January 10th and 11th 1956, ministers in MIA met in Atlanta other ministers who worked in the south. The result of this meeting was the founding of the Southern Christian Leadership Conference. Martin Luther King was elected its president. It wanted to build on the success on the civil rights movement in areas such as transport and education but in a non-violent way.